Whiskybase uses tracking cookies in order to improve the website. Do you allow Whiskybase to place these cookies? You can always change your decision under the privacy settings of your account. Regardless of your choice Whiskybase places functional cookies to store settings and account information. This block is only visible for Whiskybase members. 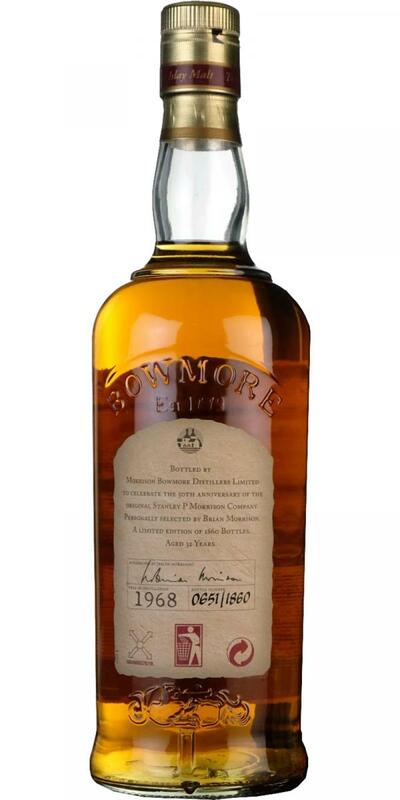 [November, 2001] I had my first dram during a Jim McEwan tasting while cruising the river Rhine aboard MS Godesia. In my old rating system (ten scales that translate into WB points: 50 - 66 - 75 - 80 - 82,5 - 85 - 87,5 - 90 - 92,5 - 95) I scored this 92,5. My notes state an adorable fruity nose centered around blackcurrant aromas. 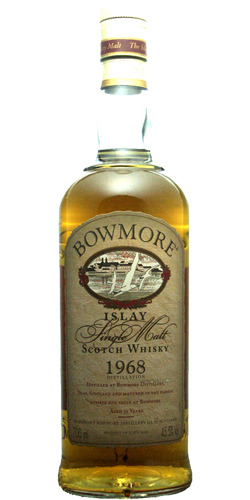 The body is well-balanced with fruity, peaty and maritime flavours. The finish is okay (whatever this meant to me back then - I guess it is medium as I stated short or long finishes with other drams in that line-up). wonderful nose: oldschool, maritime-spicy, not as one-sided fruity as the DT 66er. Very fresh, a touch of smoke. Fresh with a little vanilla ice cream. Gaumn: silky-smooth aromas of exotic fruits. Passion fruit, spicy, creamy, some salt. Full-bodied with charming barrel flavors, also fresh, nice and light, spicysweet. A hint of perfume, vanilla. Very long and not a bit tired, becomes more and more fruity with time. I didn't write a proper tasting note for this one when I tried it because I was with company, but I remember liking its fruity, gentle, and not overly cask-influenced profile very much. The downside for me was that the body was lighter and more delicate than I expected. Had it been heavier, more present (or maybe if the bottle had been more fresh), I could see myself scoring it higher. The nose and palate are delightful. N: [Tasted blind]. Most bizarre in that it smells of my dad! 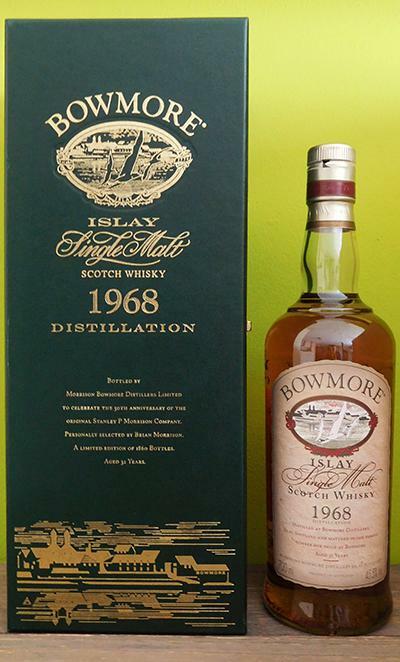 Jokes aside, we all know our parents have a distinct scent and mine rather poetically omits the aroma of 1964 Bowmore! Back on earth, this is bready with extraordinarily compacted cereals, putty, vanilla, tutti-fruity, a hint of creamy peat, a touch of farm. I find the profile neither particularly unfamiliar nor overtly striking/reminiscent, and yet there is something unusual/rare & yet ‘just so’. We must be in the 1970s, even probably the 1960s. T: More compacted cereal fruits and a time-stretched [long summer days], lip-smacking developmental journey. F: Concludes eventually with sweet-bitter-dry bourbon vanilla, but what happens before the end-goal is rather,.. ideal. C: I cant place this at all. Theres nothing out of the ordinary in terms of alarming finishes, outrageous hyper-notes, bombs, tricks,.. Everything is [old skool] 'just so' and yet im not sure ive quite a reference for it - so actually in that way it is indeed 'out of the ordinary'. 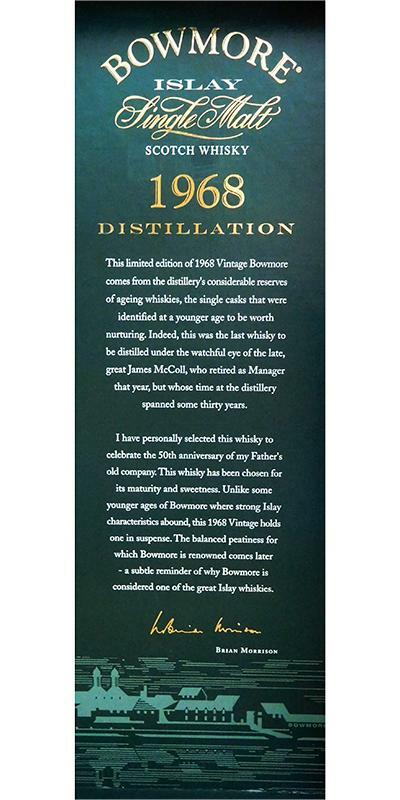 Revealed: Bowmore. 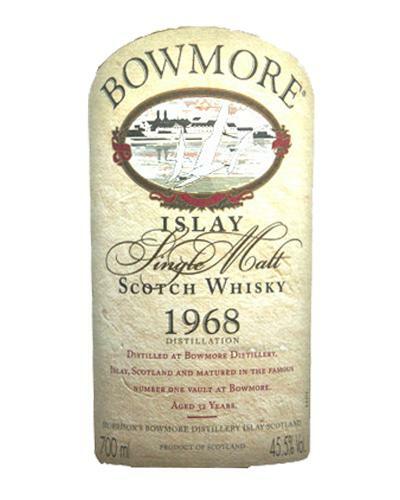 The 'old man' asks me whether id ever had '60's Bowmore before. I wasnt sure i had, and i can confirm that this was my first.My score wavered between A- and A so today then: an A[-]. 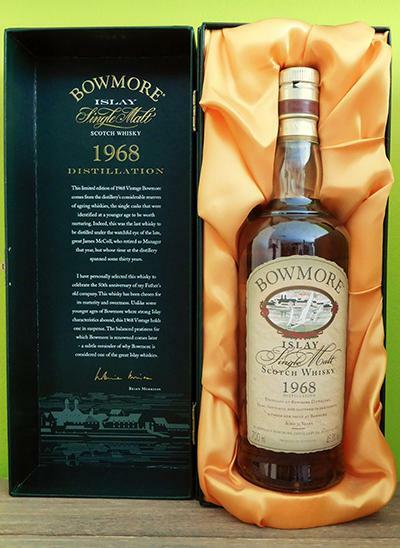 Stanley P Morrison company, owners of Bowmore since 1963. Add tasting tags by clicking the flavours you recognized in this whisky. Whiskybase is founded in 2007 with the goal to create the biggest resource of whisky information in the world. A community driven website built by and for whisky enthusiasts.